Italy - IOM’s Chief of Mission for Libya, Othman Belbeisi, reported today on the latest deaths from that country’s coastal waters. “We are still waiting for more details, but we have learned there were 400 migrants on one of two boats; 100 have already been rescued - nine of them women, and two girls,” Belbeisi explained. He said Libyan authorities under the Ministry of the Interior’s Directorate for Combating Illegal Migration (DCIM) “are expecting to receive another 150 survivors today. The rest of the people are still missing in the sea.” IOM’s Libya chief added Libya’s government is poorly equipped to carry out rescue operations at sea. IOM, working with a local partner, met the first groups of rescued migrants, who were transferred to the Sobrata centre west of Tripoli and given hygiene kits. Belbeisi said IOM will be working through the day today (28/8) to collect information regarding the migrants’ nationalities and ages. IOM teams in Italy, citing local media, say hundreds of people are feared dead from the twin shipwrecks. “The Libyan coast guard worked overnight on Thursday to search for survivors,” said IOM’s Flavio Di Giacomo. He said that at least 100 bodies were taken to a hospital in Zuwara, west of Tripoli. Di Giacomo said according to media reports from Libya, victims included migrants from Syria, Bangladesh and several sub-Saharan African countries, although he explained the information could not be independently verified. The remains of five children, aged between one and three years old, were among the bodies already recovered, as well as six men and one woman. Zuwara is at the epicentre of the migrant crisis on the Libyan side, with many of the thousands of people who flee to Europe from Libya leaving from its 120km coastline. Over 2,900 migrants were rescued Wednesday in the Channel of Sicily by the Italian Coast Guard, the Italian Navy, and by international ships operating under the EU rescue mission Triton. Privately funded rescue vessels Phoenix and Dignity I also participated in various rescue missions. Thursday’s operations also yielded reports of dozens of deaths, either by drowning or asphyxiation, bringing this year’s fatalities to 2,432 for all sea-borne migrants bound for Europe. Through this date in 2014, IOM’s Missing Migrants Project calculated there were 2,081 deaths at sea. With four days remaining in the month, IOM calculates that in August, about 18,000 migrants have arrived in Italy from Libya. Around 400 migrants have perished on this route so far, which is fewer than the 474 IOM believes lost during the same period in 2014. Data on deaths of migrants compiled by IOM. All numbers are minimum estimates. Arrivals estimates based on data from respective governments and IOM field offices. The Swedish Coast Guard ship Poseidon found 51 corpses in the hold of one boat which was also carrying 441 survivors. The migrants were probably asphyxiated by the fumes of the engine and could not manage to exit the hold. The recovered bodies, together with the rescued migrants, were brought on Thursday night to Palermo. During a dramatic landing that took place on Wednesday evening in Lampedusa, 124 migrants (mainly Nigerians, Ghanaians, Sudanese, and Senegalese) were brought ashore by the Italian Coast Guard, together with the corpses of three Nigerian women who had died of asphyxiation. This is the second time in less than two weeks where bodies were recovered of migrants presumed to have been overcome by engine fumes. The Italian Navy ship Cigala Fulgosi carried out a rescue operation on August 15 some 21 miles off the Libyan coast after receiving distress calls from a fishing boat carrying hundreds of migrants. The Italian crew found 49 dead migrants in the hold. 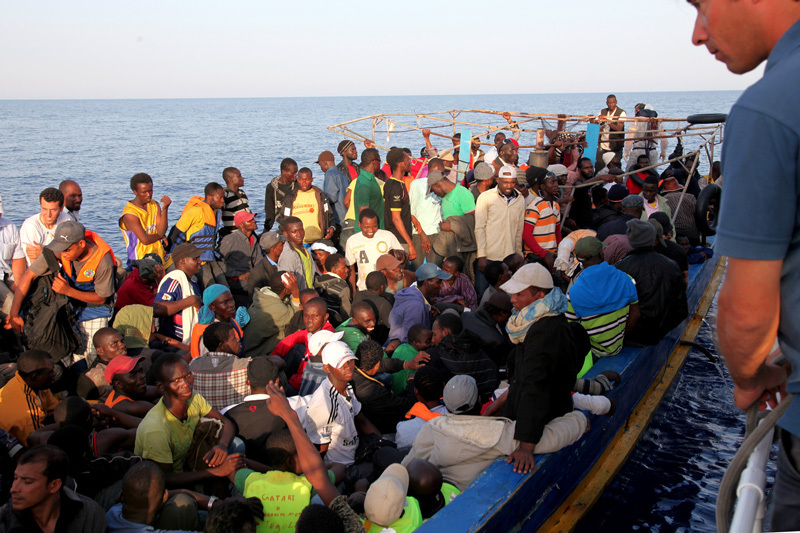 Some 312 migrants, including 45 women and three minors, were rescued. According to testimony gathered by IOM staff on Lampedusa Thursday, the migrants were travelling on a rubber dinghy when at least 10 of them, Nigerians and Ghanaians, were knocked into the water by a large wave. Five people went missing, while the others managed to get back on board. Panic broke out, the dinghy started to take on water and, when migrants saw that rescuers were approaching, they started to rush from one side of the boat to the other. Witnesses said they saw three women crushed in the stampede. This was the likely cause of death, although doctors may yet determine that they suffocated due to fumes from the engine. One of them was nine months pregnant, while another one was travelling with her three-week-old daughter. On arrival in Lampedusa, 16 women were immediately sent to the hospital, as they had severe burns to their bodies, caused by leaking fuel. “Many migrants also start the journey in a very precarious state of health, probably because bad conditions in detention in Libya. Three days ago a 14-year-old Somali boy died after having being rescued. He had suffered beatings in Libya and been forced to do heavy labour without adequate food or water. He eventually died as a result of the beatings. These acts of violence constitute serious crimes. They are not isolated incidents, but part of systemic abuse of migrants, too often resulting in death," Soda notes. Or Daniel Esdras at IOM Greece, Tel: +30 210 9912174 Email: iomathens@iom.int or Kelly Namia, Tel: +302109919040, +302109912174, Email: knamia@iom.int. Or Emrah Guler at IOM Turkey, Tel: +903124541138, Email: eguler@iom.int. Or Ryan Schroeder at IOM RO Europe, Tel: +32 2 287 71 16, Email: rschroeder@iom.int.